NOTE: This listing is an example of a benchmark cache type, in this case it in an example of a benchmark NOT listed in the NGS database. Although it is currently listed as a virtual, it will eventually be converted to the new benchmark type when that is rolled out, or it will be archived and relisted. The final format may change in accordance to the listing requirements once those have been decided. you are welcome to find this virtual cache all the same, while it is still active. 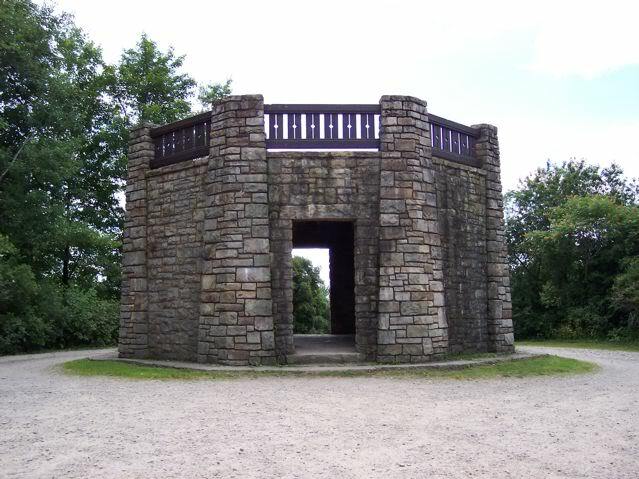 This USGS Benchmark disk is located at the base of the Stone Tower in Allegany State Park. If you can find your way to the Stone Tower (and it is well marked), you will find the benchmark. It is at ground level. Please include photo proof of your visit. Any Found It logs without proof of visit may be deleted. It must be clear from your photos which benchmark was visited, since they can look very similar from a distance. A close up photo showing the markings may be required. Great spot to visit, I enjoy the tower and view. Thank you placing the cache at this location. While attending ASP Geobash 2018, With TBC! [:)] T4TC!